8100 - V Neck and Collared Cardigans using Hayfield Bonus Aran Tweed Leaflet with designs for V Neck and Collared Cardigans using Hayfield Bonus Aran Tweed. 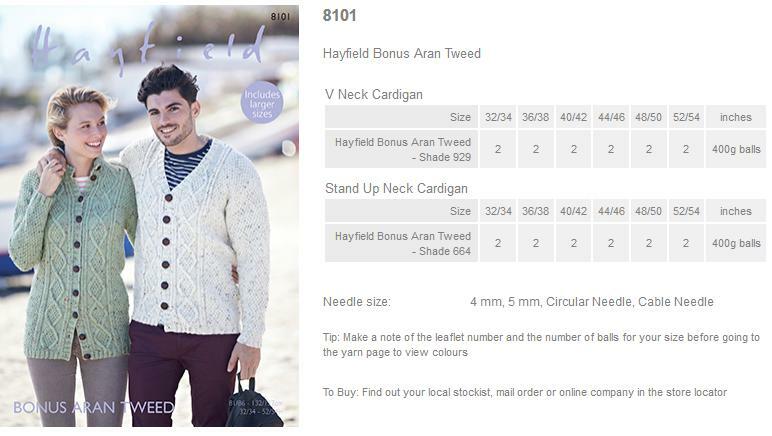 8101 - V Neck and Stand Up Neck Cardigans using Hayfield Bonus Aran Tweed Leaflet with designs for V Neck and Stand Up Neck Cardigans using Hayfield Bonus Aran Tweed. 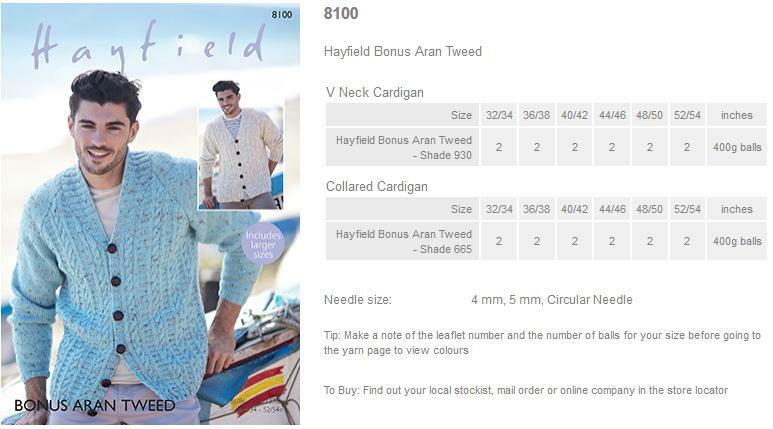 8102 - Round Neck and Flat Collared Cardigans using Hayfield Bonus Aran Tweed Leaflet with designs for Round Neck and Flat Collared Cardigans using Hayfield Bonus Aran Tweed. 8227 - Sweater using Hayfield Bonus Aran Tweed Leaflet with a design for a Sweater using Hayfield Bonus Aran Tweed. 8228 - Sweater using Hayfield Bonus Aran Tweed Leaflet with a design for a Sweater using Hayfield Bonus Aran Tweed. 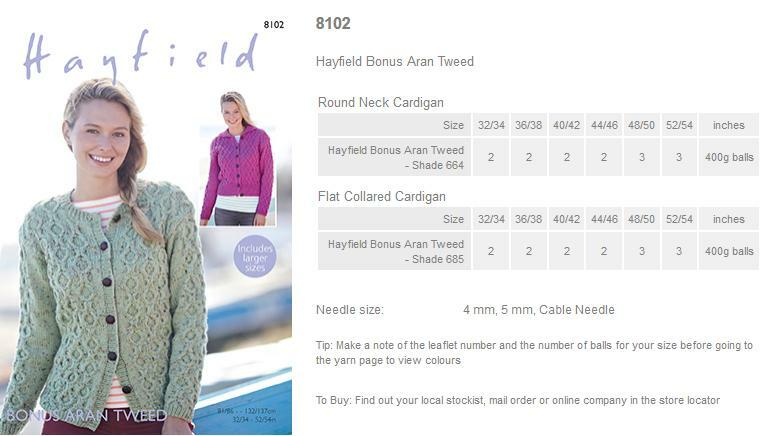 8229 - Cardigans using Hayfield Bonus Aran Tweed Leaflet with designs for Cardigans using Hayfield Bonus Aran Tweed. 8230 - Sweater using Hayfield Bonus Aran Tweed Leaflet with a design for a Sweater using Hayfield Bonus Aran Tweed. 8231 - Jacket using Hayfield Bonus Aran Tweed Leaflet with a design for a Jacket using Hayfield Bonus Aran Tweed. 8232 - Cardigan using Hayfield Bonus Aran Tweed Leaflet with a design for a Cardigan using Hayfield Bonus Aran Tweed. 8233 - Sweater using Hayfield Bonus Aran Tweed Leaflet with a design for a Sweater using Hayfield Bonus Aran Tweed. 8234 - Sweater using Hayfield Bonus Aran Tweed Leaflet with a design for a Sweater using Hayfield Bonus Aran Tweed. 9804 - Cushion Covers using Hayfield Bonus Aran Tweed Leaflet with designs for Cushion Covers using Hayfield Bonus Aran Tweed. 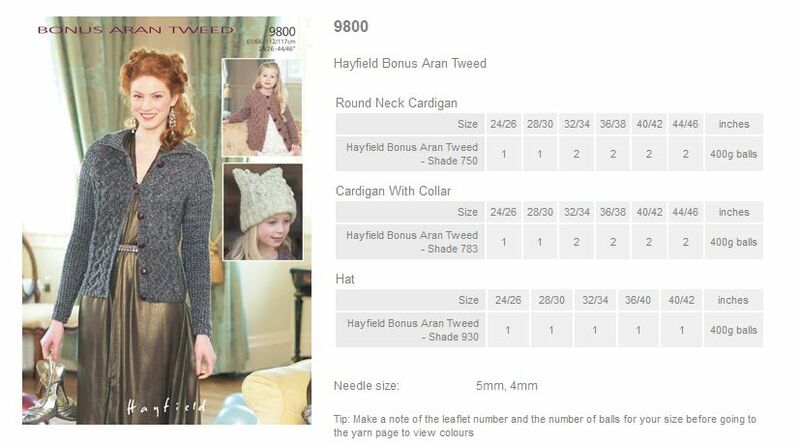 9803 - Round Neck Sweater, Wrap Neck Sweater and Hat using Hayfield Bonus Aran Tweed Leaflet with designs for a Round Neck Sweater, Wrap Neck Sweater and Hat using Hayfield Bonus Aran Tweed. 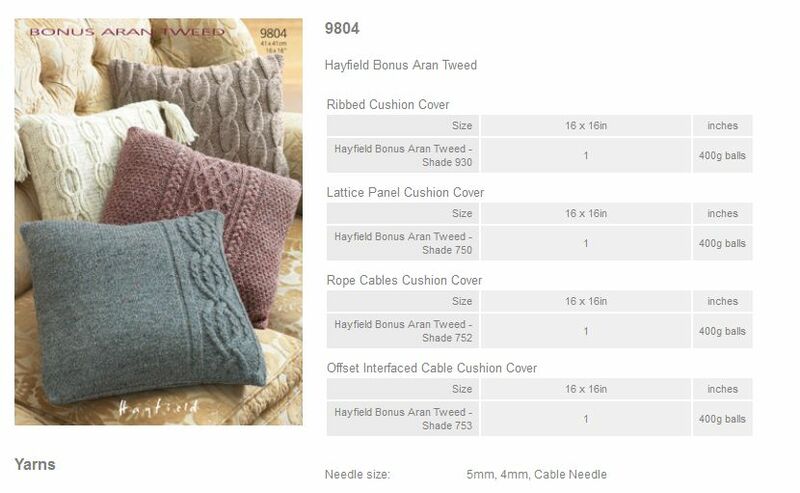 9802 - Cardigans using Hayfield Bonus Aran Tweed Leaflet with designs for Cardigans using Hayfield Bonus Aran Tweed. 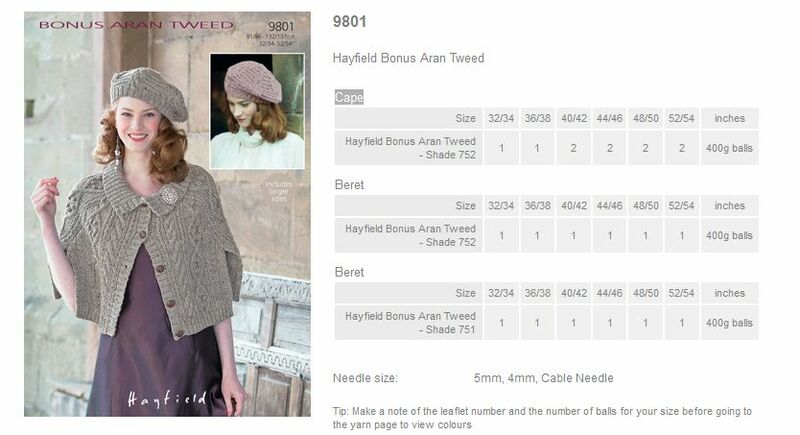 9801 - Cape and Berets using Hayfield Bonus Aran Tweed Leaflet with designs for a Cape and Berets using Hayfield Bonus Aran Tweed. 9800 - Round Neck Cardigan, Cardigan with Collar and Hat using Hayfield Bonus Aran Tweed Leaflet with designs for a Round Neck Cardigan, Cardigan with Collar and Hat using Hayfield Bonus Aran Tweed. 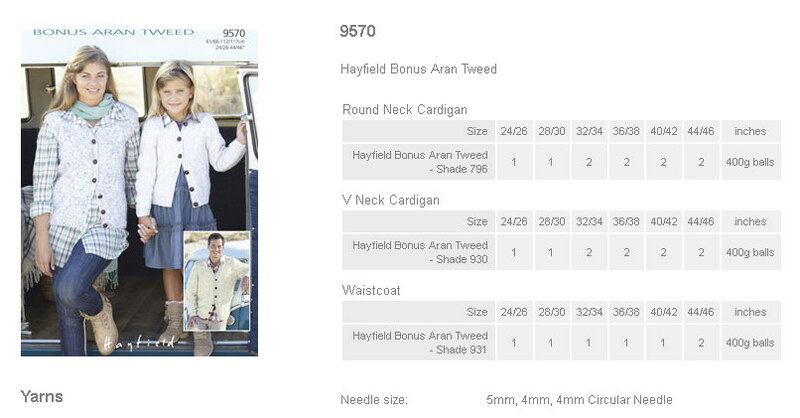 9570 - Round Neck Cardigan, V Neck Cardigan and Waistcoat using Hayfield Bonus Aran Tweed Leaflet with designs for a Round Neck Cardigan, V Neck Cardigan and Waistcoat using Hayfield Bonus Aran Tweed. 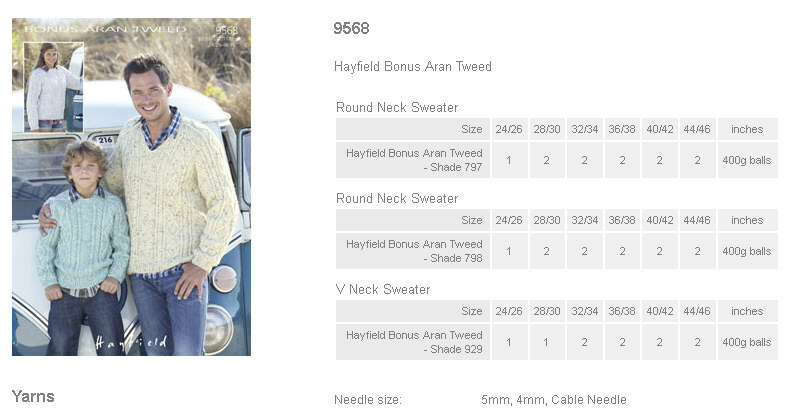 9569 - Round Neck Sweater and Sweater with Stand-up Neck using Hayfield Bonus Aran Tweed Leaflet with designs for a Round Neck Sweater and Sweater with Stand-up Neck using Hayfield Bonus Aran Tweed. 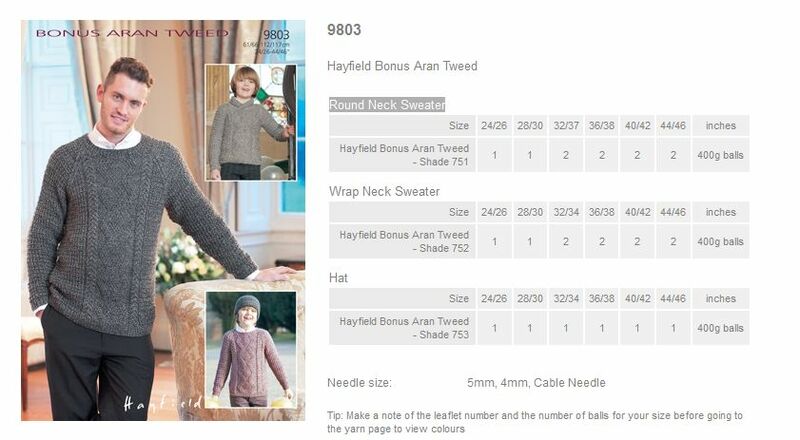 9568 - Round Neck Sweater and V Neck Sweater using Hayfield Bonus Aran Tweed Leaflet with designs for V Neck and Round Neck Cardigans using Hayfield Bonus Aran Tweed. 2390- V Neck Cardigan and Cardigan With Collar using Hayfield Bonus Aran Tweed Leaflet with designs for a V Neck Cardigan and Cardigan With Collar using Hayfield Bonus Aran Tweed.